If there is one thing about American Samoa you must know, you can not get lost. There is one main road that goes around the entire island. We have some of the most amazing views while driving. This is from a trip to Manu’a I took a while back. Probably not taken on the best of days, but still beautiful none the less. I took it from the back of a truck while we were driving from one island to the other. When I use to live in America, I use to get a lot of questions about where I’m from. I was proud to say American Samoa. Regardless of the ignorant stereotypical replies I would receive, I enjoyed showing off photos like the one above. I love my beautiful island home. The scenic hikes are just the icing on the cake. American Samoa is about the Samoan culture, the history, my heritage, my people. No matter where I go, American Samoa will always be home simply because this is where my heart is. I have always admired the natural beauty around me since I was little. I have always loved beautiful things because I know I serve a beautiful God. How do I know my God is beautiful? I see it in everything He has created and in each day He orchestrates. The God I serve is the greatest artist. His creation is so beautiful. There is always something new outside for me to enjoy, I just have to open my eyes and see it for what He created it be. Beautiful. I sincerely believe the greatest work of art is a new day of promise. I never encounter the same view or scenery every morning when I wake up. It took me a while to figure out what I wanted to use to portray a “work of art” until I came across the symbol of promise God created for Noah that still stands as a testimony of God’s promise to never destroy the earth again (Genesis 9:13). Isn’t this the most beautiful covenant you have ever seen? 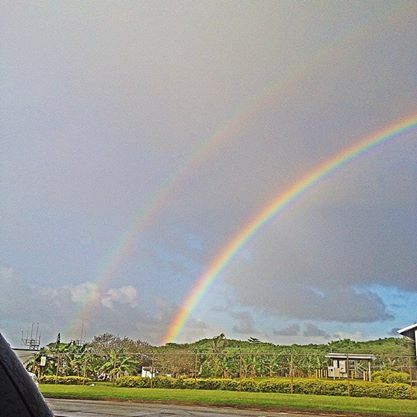 Double rainbow this morning while getting out of my car across from my workplace.